I'm often asked, "Tom, where do you get your info from?" Next to some great websites, which can be found on my Phototips page, there are several great books. Unfortunatly most are out of print. But you can still find them on auction sites. Some of these have set the standards for collectors. Here is an overview of 5 of them, some unknown, some well known and one new one. 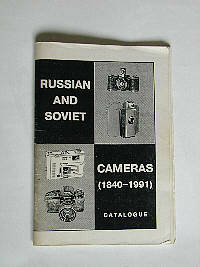 These are the only books I have on Russian Cameras, there are a few more. But these are even harder to find and are often in Russian. Often referred to as the Bible of Russian camera collectors or simply as Princelle we have THE standard work on Russian Cameras. 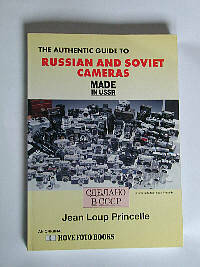 Its full title is "The Authentic Guide to Russian and Soviet Cameras " and it is written by Jean Loup Princelle. It is out of print but Princelle has been working on a new version which will (with a bit of luck) be published this year. I said standard work, because this is one of the most comprehensive and best laid out books on Russian Cameras. It tells about history, the different factories, has info on the lenses and the cameras. It basicly covers all Russian equipment. And it has production numbers. It is a MUST have for every serious collector. Number of copies is unknown but it is rumoured to be 1500 to 2000 copies. I have no idea if this means ALL of them. Because there is a French edition and a English translated version (with some quirks in the translation). A new edition is now available (2004) known as the Second Edition, making it even better, MORE on everything plus info on lightmeters. "Zenit Die Geschichte der russische Spiegelreflex-Prismensucherkamera mit M 39-ObjektivanschluB" By Alexander Schulz. (German only and a limited edition of 200 copies). This book is what I call the last word on the M39 Zenits. It is written excellently. 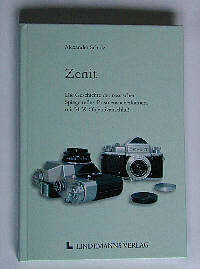 It covers the early Zenits (Zenit and Zenit-C), the Zenit-3, Kristall, Zenit-3M and the early E-types and B-types. It has info on ALL the prototypes of the M39 Zenits (with shots of the prototypes), including some stunning info on the Kristall and 3M series. It has a lot of background and historical info, productioninfo and even shots of the inside of someof the Zenits. On the M39's you can't get any better than this. A must for every collector on Zenit. The book is written in German and has a limited edition of 200 copies. "All You Need to Know about Design and Repair of Russian Cameras." By Isaac S. Maizenberg. subtitle, "A Collector's and Repairman's Handbook". Sometimes referred to as Maizenberg. The late Maizenberg has written several books and was one of the Last true camera-engineers. This is the only known English book he wrote. And it is nothing less than Excellent. 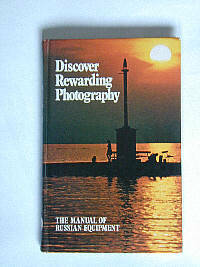 There is repair info in this book on all the mainstream Russian Cameras, Kiev, Zenit, Zorki, Fed, and several others. This book however stops before 1965. Before the Zenit-E. Allthough Maizenberg does not mention the E-type he does covers the Zenit Krystall and the Zenit 3M. Which were the E-types predecessors. 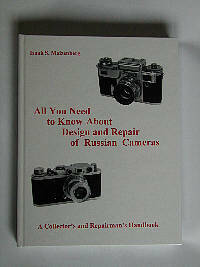 This book is a MUST for everyone who wants to repair their Russian cameras. It covers the first SLR's, rangefinders and has full info on calibration of rangefinders and lenses. Unfortunatly it is a rare and hard book to find. Number of copies is unknown but it is rumoured to be a 1000. It is what it is, a small catalog with production numbers and prices in dollars (US). Unfortunatly the production numbers are not accurate and the overall quality leaves much to be desired for. It looks more like a number of photocopies bunched together. But it is a lot smaller than Princelle and can be used on any camerafair. Number of copies unknown. It is no longer in print. "Discovering Rewarding Photography" By Ronald Spillman. Published by TOE in England. TOE were the importers of Zenit and several other Russian Cameras in the West and asked Ronald Spillman to write this book. It is an odd book. It praises Russian optics and cameras but is also a very usefull photography guide. It was published in the seventies but you can still find copies on the web. There are even lens specifications in this book. All in all I found this to be fun book to read. It was clearly written to promote Russian cameras and lenses but that doesn't make it bad. If you find a copy, pick it up and have a read. Number of copies is unknown and it hasn't been in print since the days of TOE. So basicly it is out of print since the seventies.